The 2012 United States Senate election in Maryland took place on November 6, 2012, concurrently with the 2012 U.S. presidential election as well as other elections to the United States Senate, House of Representatives, and various state and local elections. Incumbent Democratic U.S. Senator Ben Cardin won re-election to a second term, defeating Republican nominee Dan Bongino and independent Rob Sobhani. A candidate's forum was held on Baltimore's WOLB radio on October 24 including Senator Ben Cardin, Rob Sobhani, Dean Ahmad and Daniel Bongino. An October 30 debate at Salisbury University to have featured those candidates and independent Ed Tinus was cancelled in the aftermath of Hurricane Sandy. In 2006, then-U.S. Representative Ben Cardin defeated then-Lieutenant Governor Michael Steele 54%–44%. Eric Wargotz, the Republican nominee in 2010 had considered entering the race but ultimately did not. In both 2010 and 2009, National Journal magazine rated Cardin as tied for most liberal senator, based on his voting record. As of June 30, Cardin had $1.8 million in his campaign account. ^ a b c d e f g "Md. Former Teacher Plans Run for U.S. Senate". CBS Baltimore. Associated Press. September 21, 2011. Retrieved September 30, 2011. ^ "Maryland Politics: Cardin to kick off campaign - Politics and Policy from Baltimore, Annapolis and Washington". The Baltimore Sun. ^ "Political Notes: O'Malley receives planning award". The Capital. Annapolis, Maryland. January 12, 2012. ^ Fritze, John (January 5, 2012). "State Sen. Muse to challenge Cardin for Senate". The Baltimore Sun. ^ Fritze, John (April 3, 2012). "Ben Cardin wins Senate primary". The Baltimore Sun. Retrieved April 3, 2012. ^ a b "Ex-agent Bongino wins Republican Senate primary; will face Sen. Benjamin Cardin in November". The Washington Post. April 4, 2012. Retrieved April 4, 2012. ^ a b "Official 2012 Presidential Primary Election results for U.S. Senator". Maryland State Board of Elections. Retrieved May 26, 2012. ^ "Ex-Secret Service Agent To Run For Senate". CBS Baltimore. Associated Press. May 31, 2011. ^ "John Bolton says Md. is "winnable" for GOP". The Baltimore Sun. March 6, 2012. Retrieved December 1, 2014. 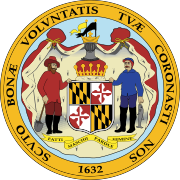 ^ "Politics1 Online Guide to Maryland Politics". politics1.com. November 28, 2011. Retrieved December 3, 2011. ^ Farrell, Liam (December 8, 2010). "Ehrlich not interested in another office". The Capital. Retrieved December 10, 2010. ^ "Maryland Politics: Murphy to chair Senate campaign, not run, in 2012 - Politics and Policy from Baltimore, Annapolis and Washington". The Baltimore Sun. ^ Fritze, John (November 3, 2011). "Wargotz forgoes Senate run". The Baltimore Sun. Retrieved February 2, 2012. ^ Razzi, Robin (October 24, 2012). "Senatorial Debate 2012: What You Missed". WOLB. Retrieved October 25, 2012. ^ White, Brian (October 25, 2012). "Maryland Senate candidates debate on economy". Cumberland Times-News. Retrieved November 4, 2012. ^ "Maryland Gazette Political Notes: Cardin, Bongino, Sobhani set first debate in Salisbury". Maryland Gazette. October 20, 2012. Retrieved November 4, 2012. ^ Kunkle, Fredrick (November 2, 2012). "Rob Sobhani, independent in Maryland Senate race, makes closing argument". The Washington Post. Retrieved November 4, 2012. Hurricane Sandy forced Salisbury University to call off a debate that would have put him on the same stage with Sen. Benjamin L. Cardin (D) and Republican challenger Daniel Bongino. ^ Wagner, John; Pershing, Ben (September 28, 2011). "In Md., Anthony Muse considers primary challenge to Sen. Cardin". The Washington Post. ^ "Congressional Elections: Maryland Senate Race: 2012 Cycle - OpenSecrets". ^ "Congressional Elections: New York District 01 Race: 2012 Cycle - OpenSecrets". ^ "2012 Senate Race Ratings for November 1, 2012". The Cook Political Report. Retrieved September 20, 2018. ^ "2012 Senate". Sabato's Crystal Ball. Retrieved September 20, 2018. ^ "2012 Senate Ratings". Senate Ratings. The Rothenberg Political Report. Retrieved September 20, 2018. ^ "2012 Elections Map - Battle for the Senate 2012". Real Clear Politics. Retrieved September 20, 2018. ^ 2012 General Election Results, Maryland State Board of Elections, November 28, 2012. Retrieved January 16, 2018. This page was last edited on 16 April 2019, at 02:15 (UTC).